August 01, 1988, L. G. Crabo. 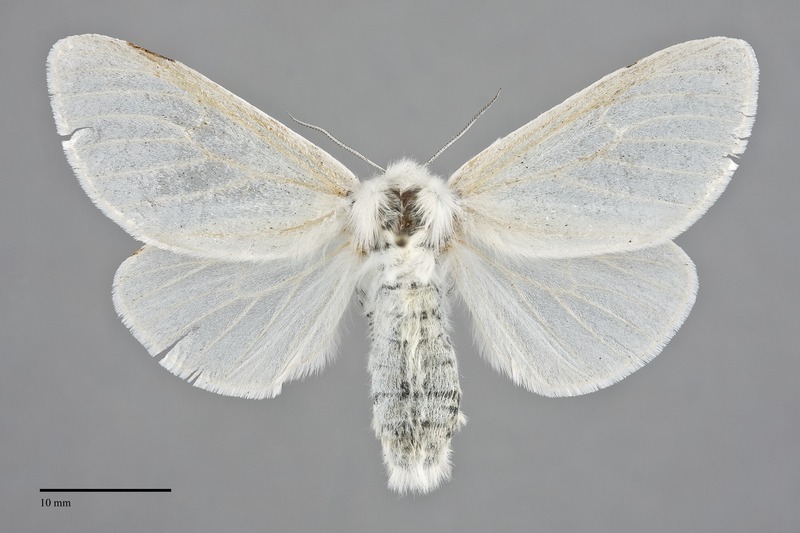 Leucoma salicis is a medium-sized to large moth (FW length 17–23 mm in males; 21–27 mm in females) called the Satin Moth or White Silk Moth because it has all white forewings, hindwings, and body. 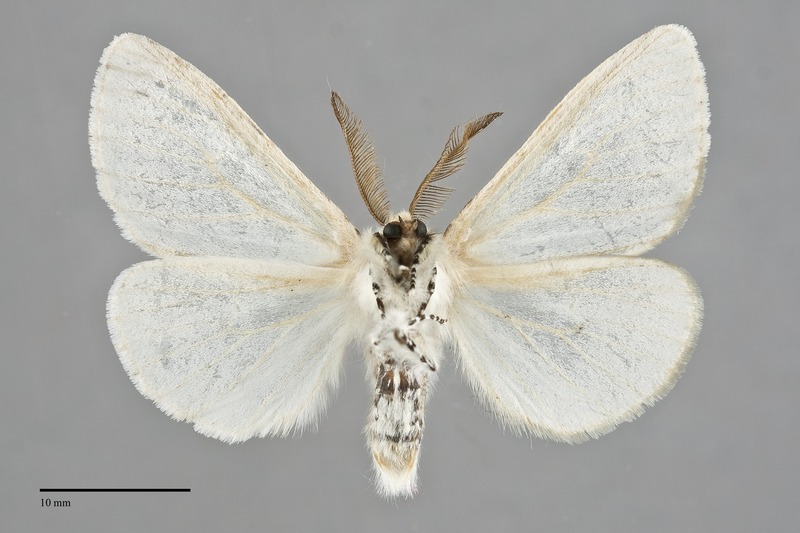 The wings have a satin-like sheen and are completely devoid of markings. Each segment of the tibiae and tarsi of the legs are marked by a series of black bands. Both males and females have bipectinate antennae, widest in males. 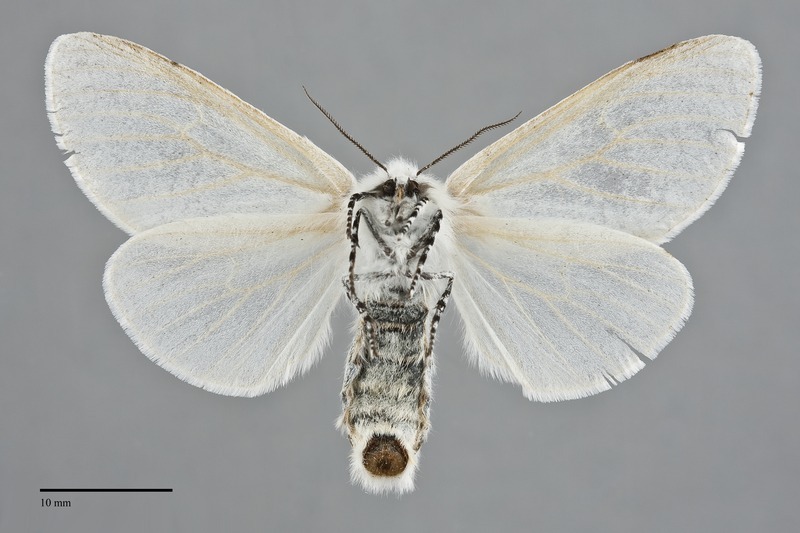 This species can be identified by its shiny all-white wings and body. 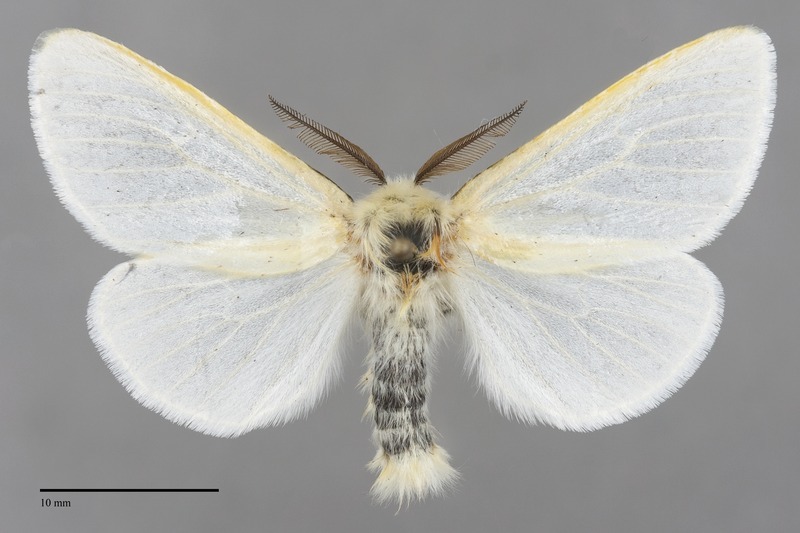 Several species of tiger moths (subfamily Arctiinae) are all white or nearly white wings. They have colored legs--usually yellow or reg-- or some darker gray or black spots on the wings. The introduced Euproctis similis has all-white wings, but has a yellow tip to the abdomen. This species has been found on Vancouver Island in the past but has not been recollected in the Pacific Northwest for many decades. Larva is relatively smooth with short, hairy red tubercles or scoli along the back and sides. The sides are mottled gray, and the back is black with large white spots. It is illustrated by Miller & Hammond (2003). This species is an exotic introduction from Eurasia that has become widely established throughout much of North America. It is usually found in riparian habitats along creeks and rivers, in disturbed agricultural and urban areas, and in quaking aspen forests of the Rocky Mountains. 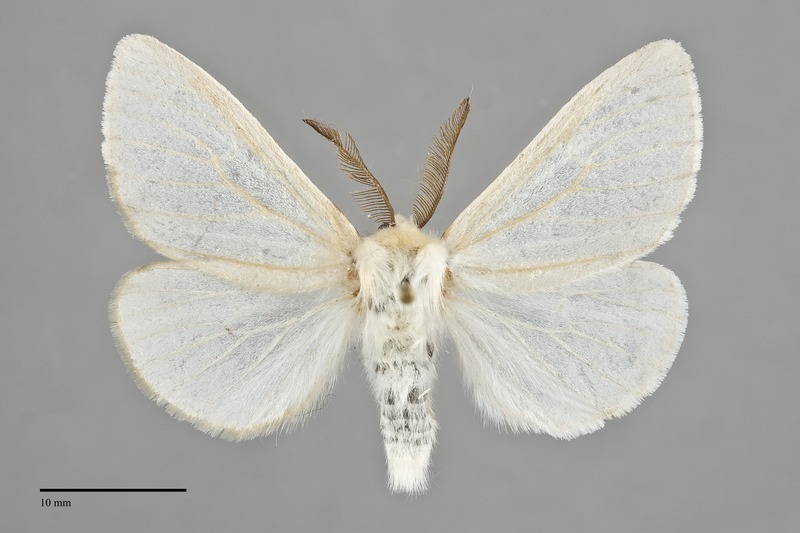 The Satin Moth occurs throughout much of the Pacific Northwest north to the southern third of British Columbia. It has been least commonly collected in arid steppe habitats where it limited to riparian areas. This species is native to Eurasia from western Europe through Japan. It became established in the Pacific Northwest and separately in eastern North America sometime before 1920. The East Coast population had expanded from the St. Lawrence River to Ontario and New York. The West Coast population extended as far south as northern California by the 1970's (Ferguson 1978). 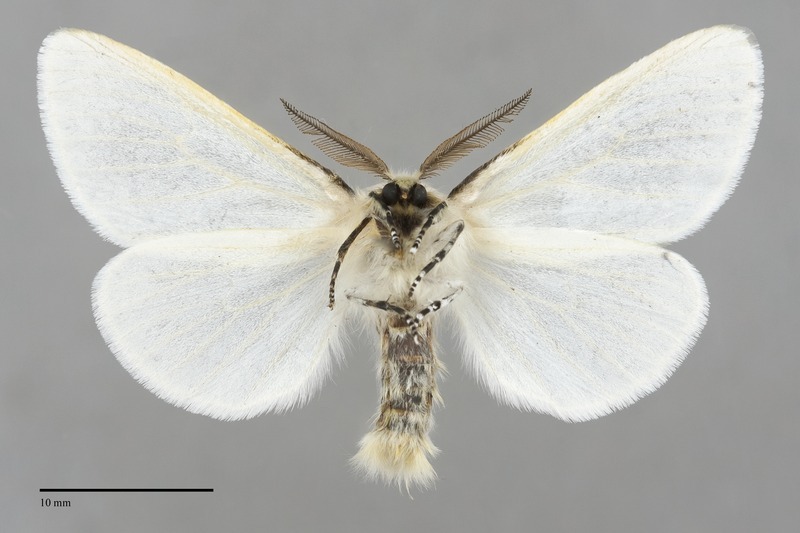 Most reports suggest that this species over-winters as an egg in the United States, although it has been suggested that young larvae can do so as well. This species is a foodplant specialist feeding on Salicaceae, including willows (Salix spp.) and cottonwoods (Populus spp. ), and particularly favors quaking aspen (P. tremuloides). Adults fly from early June through August, are nocturnal, and come to lights. They do not feed as adults.